I watch so much Food Network you would think I would be a Master Chef by now. Ha! Not really, but always trying to improve and expand myself as a baker. 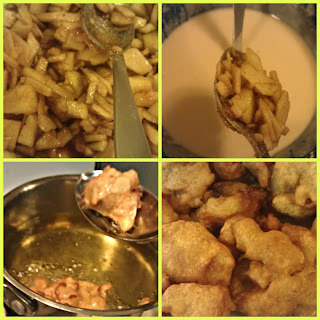 I was watching an episode of The Best Thing I Ever Made and was inspired by Sunny Anderson's recipe. I changed a few things along the way. I think I used Apple Pie Spice instead of Pumpkin Spice. Beer batter is super quick to whip up. I used 1 cup of flour and 1 cup of beer...but added a little more flour because I realized the consistency needed to be thicker. When I'm in the kitchen, everything is a fun little experiment. 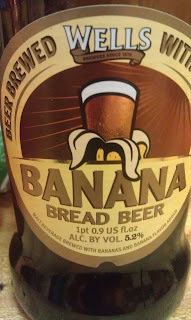 Check out this yummy beer that we used for the batter. I say we because my hubby joined in the fun. He also likes this beer by itself. He also helped rescue the caramel peanut butter sauce. Rescued it from me. Let's just say, I could never be a candy maker. Once done frying, everything came out great. I will be experimenting with all different types of beer for batters. Maybe next time will be onion rings or fish n chips. Do you like to fry things? Dip things in batter?